Hire a Car and head to Agios Nikolaos for a dream holiday either with your friends or family. Agios Nikolaos is the touristic and cosmopolitan capital of Lasithi Prefecture. 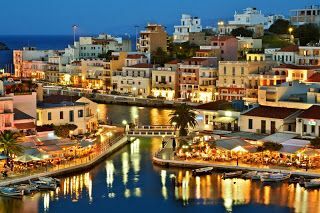 Despite the fact that has only 10.000 inhabitants is the biggest city in the Prefecture and the smallest major city of Crete. The touristic development of city started approximately forty years ago however retains its picturesqueness and promise visitor’s cheerful and relaxing holidays. It is located in the biggest natural bay of Crete, the bay of Mirabello named thus because of the beautiful view that one can enjoy from the town to the sea. The heart of the town beats around Lake Voulismeni which is full of myths and legends such as that is bottomless, that is connected with Santorini via an underground tunnel and the fact that after the World War 2 ended Germans threw into the lake war materials, equipment, vehicles etc. Agios Nikolaos is the destination that enthusiasts thousands of visitors every year with its tranquility and serenity. 65 km from rent a car Heraklion airport, it is the Crete with the ancient towns, the many beautiful beaches, traditional villages, and also cosmopolitan areas, beautiful remote churches and impressive gorges. We Will wait YOU at the Hotel! Nothing more welcoming than waiting you with our smile at Agios Nikolaos!